Xin Nian Kuai Le! Well actually that greeting came a bit late! Haha.. but I still wanted to say it! Happy Seollal! 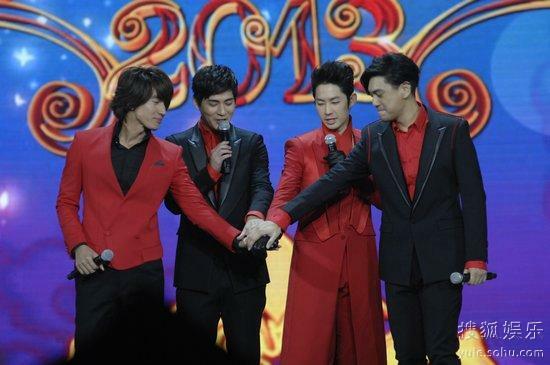 I have been so excited for the past few weeks when I read that the original F4 (Jerry Yan, Vic Zhou, Ken Chu and Vanness Wu) were reuniting for a show for Chinese New Year. I knew that the show was pre-recorded and I have seen some fancams already but I actually waited for the video of the broadcast to be available before making this post. And today, I finally found a video! I am not sure if a lot of the new Asian fans would recognize them, but to me they were the reason why I succumbed to the Asian invasion. Before them, I only knew of boy bands who were from Europe or North America. Didn’t really cared that much about Asian boys. Until there was F4!!! I could still remember how crazy I was over them. Not only me, this craziness swept the Philippines and it opened doors to having more Taiwanese, Japanese and Korean dramas being show in the country. But they were always the first. They were the original Flower Boys! Before everyone knew Go Jun Pyo, everyone was talking about Dao Ming Si! Before Boys Over Flowers (Korean) and Hana Yori Dango (Japanese) there was Meteor Garden. Now, as I see them together again, I can’t help grinning from ear to ear! OMG!! I know they have become mature now (I don’t want to use old!! ), but it doesn’t stop me from liking them still. I have honestly waited for this reunion to happen. I have read that they have wanted to have one for the last 3 years but because of their schedules, they couldn’t do it. But this year they did and thank heavens they did! And goodness me, they are still so handsome! Zai zai ai ni! (pardon this crazy fan!). This really really made my day! Wish they would do something like this again! Note: I have to say thanks to koalasplayground.com for posting this. My Chinese is not as good as my Korean so I couldn’t find the videos. To see the original post, please click here.